The Unmitigated TRUTH: UNESCO - The Puppet of Islam. Well, perhaps the UNESCO Scholars are just simply ignorant. After all, it is much easier to espouse the preferred Anti-Semitic diatribe, than to study the history of a noble race of people who have given the world the foundation of Ethical laws and behavior. Or perhaps the UNESCO scholars are just too busy placating their Islamic puppet masters, since the Muslims now call the Tomb of the Patriarchs the Haram al- Ibrahimi Mosque, and claim that Rachel’s Tomb was once the Bilal bin Rabah Mosque, named after the third convert to Islam. In fact, when UNESCO issued its press statement, they referred to both sites, first by their Muslim names and then by their original Jewish ones. So it seems that a quick History Lesson is called for. I will start with the Bible, what some people refer to as the "Old Testament". I will paraphrase the language of the scripture to facilitate comprehension, but the links are provided for independent verification. In Genesis, Chapter 23, we read about the purchase of the cave of Machpelah (or cave of Makhpelah, in the Christian translation) by Abraham, the forefather of the Jewish People. In fact if you continue studying the Bible, you will learn that buried in the Cave of Machpelah (referred to as Tomb of the Patriarchs in Hebron, by UNESCO), are Abraham/Sarah, Isaac/Rebecca, and Jacob/Leah. These three couples are the direct lineage of the Jewish People. 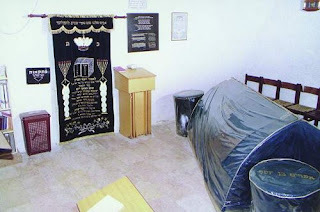 The second wife of Jacob, Rachel, died on the way back home, and was buried in what we now refer to as "Rachel's Tomb". And all this happened 1676 years before the advent of Christianity, and 2246 years before the birth of the Mohammed, the founder of Islam. So we see that these Holy places were Holy to the Jewish People before the word Mosque was invented. 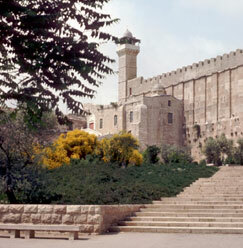 If further proof is required that these places are indeed part of Jewish History and NOT Islamic, consider that until just recently the Arabic name for the Tomb of Rachel was Qubbat Rahil (transliterated), which translates to “Tomb of Rachel”, and the Tomb of the Patriarchs is still called "Sanctuary of Abraham or Ibrahimi Mosque" by the Muslims. So, to sum up, the UNESCO has determined that these pieces of Jewish history and unbroken Heritage, are now to be known as "Palestinian Heritage Sites". In their infinite wisdom, the United Nations Educational, Scientific and Cultural Organization has taken close to 3000 years of Jewish history and with the flick of a magic wand deemed it to be Palestinian. Wow!! Great trick! But you will say to me, "What is the difference who controls these sites? They will still remain the same with just different caretakers." Joseph's Tomb as a Yeshiva, under Israeli control. 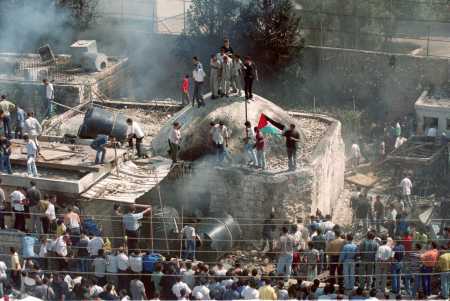 And I will answer you with "Joseph's Tomb". This site of the burial place of the famous Hebrew Viceroy of Ancient Egypt (story to be found near the end of the book of Genesis), came under Israeli control after the 1967 war. 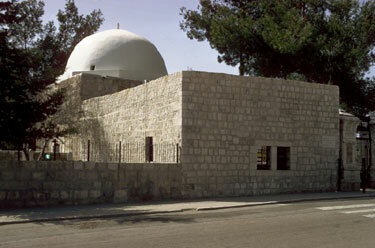 The tomb was rehabilitated by the Israeli government, and the site became a sanctuary for Bible Study and Prayers. 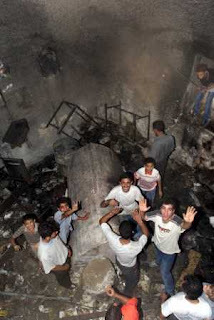 In 1995, in one of the many U.S. brokered Peace initiatives, Israel handed the control of the area surrounding Joseph's Tomb to the Palestinian Authority, keeping just Joseph's Tomb containing the "Yeshiva" (Bible Study class), guarded by a few soldiers. 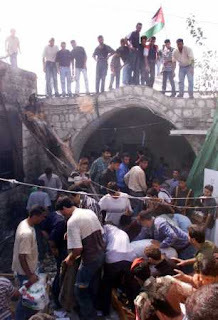 After several soldiers were killed by attacking mobs, the Jewish presence was withdrawn from the Tomb. The Palestinians now had "control" of Joseph's Tomb. Well, pictures speak louder than words. This culminated in the following scene, which you can compare to the "before" picture above. 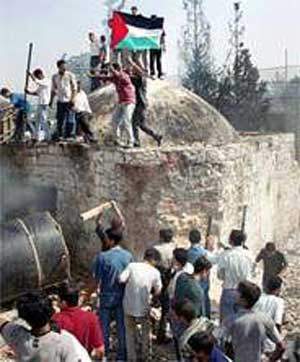 According to UNESCO, these are the people who should definitely be given control of these historic Holy Places. It is time for Judgement Day of the U.N.. This World Organization has shown repeatedly that it is no longer anything but the Puppet of Islam. It is time that the Theater that is the U.N. fold it's tent in New York City, and move on to the most logical place, Mecca. It is time that the Citizens of the United States no longer support this corrupt institution financially. It is time for ALL Americans to insist to our Elected Officials to sweep this abomination of an organization from our midsts. The sooner the better.